Table lighters collectors' guide: How to maintain table wick lighters? My buddy just bought the Crown Ronson desk lighter and we were trying to figure out how to clean the lighter and get it working. These 3 pamphlets will be extremely helpful. Thank you so much!!!! I have 3 "ASR Man" table lighters and want to make them functional again. I can't figure out how to replace the wicks, where the flints go, if the flints you can buy in the store known as "fitting all Zippo pocket lighters" fit in my lighters and if the lighters require fluid. Do you have to open the top of the lighter by prying it off? What's the hole with the screw in it under the green felt for? Whom would I take them to if I needed assistance? I need vintage Ronson wicks, the type that comes with the inserter. HELP PLEASE..
a common problem with these is that the lever wont push down all the way and this will not light. likely this is a blocked flint tube. to fix, remove the small screw on the side of the lever that you push down on. then, while applying slight pressure to the lever/snuffer, remove the screw on the other side (its not really a screw, just a tube to receive the first screw). now carefully remove the snuffer. there are two small gears, a flint wheel, and a washer inside which actuates the flint wheel. note how they go together. the washer is asymmetrical and engages the teeth on the side of the flint wheel. ANYWAYS using a nail, small screwdriver, etc. make sure the flint tube is clear and not too narrow for a flint to fall right through. you can take this opportunity to clear all those little bits you took out and polish the sides of the lever. don't remove the lever, though, as it is riveted in. once youve confirmed that the flint will drop through the top flint hole all the way through the bottom, reassemble. align the top of the lever with the top of the snuffer, hold in place, and insert the screw/tube. screw back together. insert flint, screw in flint spring, and check for spark. the flint wheel ought to turn as the snuffer raises. if it doesnt, go back and check the washer and gears. once you've got a spark, you can move on to the wick and wadding, which more often than not is OK. refill and enjoy! Thank you for all the info. on this site, it has been very helpful and a bit of fun too. I have a Ronson'Queen Ann' Table Lighter which is not working. 1. The wick needs replacing preferably with the Gold seal wick for Ronson lighters that has a wire inserter (it was very difficult to put in any other type...I got a Zippo wick which fitted but as it has not been lit I do not know if it will operate correctly. 2.The o-ring for the fuel cap disintegrated when the cap was removed. 3. I think a part of the sparking mechanism is broken as the spark wheel does not turn ..it looks like a piece of forked metal under the snuffer cap is broken. It would be nice it the lighter worked !...any help would be appreciated. I just purchased a 1938 Rolstar table lighter inscribed with 1938 Queen Elizabeth. It is missing the spring. Does anyone know of a place I can get it repaired, or, a place that sells replacement parts? It's in beautiful shape, just missing the spring. Thanks in advance for any assistance. You can try emptying a cheap off-brand modern plastic lighter & take the spring out of it. Pop the metal cap off - the instructables.com has a video, I believe. My question is, does anyone know how to adjust the striker? I have several lighters that are difficult to light. However, if I put my finger on the end of the cap & strike it, they light every time. I have a Ronson queen anne lighter that doesn't work. I replaced the flint but the wheel doesn't turn when the lever is pressed. I will turn without the flint. How can I fix this? Couple things about ronson lighters. Actually this applies to all flint and wick lighters. 1) clean the flint wheel. I use a small brass wire brush and some gun cleaner. Plastic bristle brush might also work but take a little longer. 2) make sure the flint is replaced. 3) make sure that the old flint or remnants of the old flint are removed from the flint tube. If the new flint doesnt protrude when you put the spring in, the old flint is blocking the tube passage. A very thin paperclip might help remove the blockage. Wiggle it up in the tube then gently tap the lighter on a table. You will see what looks like grey dust fall out. Continue till the passage is cleared. 5) replace the wadding. Its easier to re wick if the wadding is done at the same time. Cvs pharmacy has a bag of lambs wool which is what you need. Its in the footcare section and the little bag has enough wool to re wad at least 10 lighters. Make sure you zig zag the wick through the lighter in between the wadding. Make sur the wadding is packed tight. Use tweezers to pull out the old stuff and use a small flathead screwdriver to pack in the new stuff. 6) fill with ronsonol lighter fluid. This can be found at walmart for a couple bucks. Big yellow bottle. Fill slowly just a little then let it absorb then fill it some more. 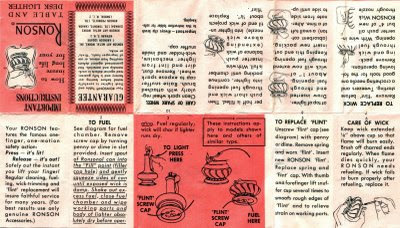 Dont overfill or the oil based fluid will get all over the flint wheel and the flint which will prevent a spark. Hope this helps everyone out there. If you have a question, im happy to help. Does the trigger actually go down all the way when you press it? If it does and the wheel doesnt spin, it means the flint wheel might be on backwards. Happens alot when people take them apart to clean them. Most have a one way type gear clutch that only allows the wheel to spin in one direction. Thanks for all the replies. I took the wheel assembly apart and it appears that the teeth on the wheel itself are worn down enough to allow it to slip. The teeth engage the gear one way and there just isn't enough there to properly do that. When the flint is installed it provides enough resistance to stop the wheel and cause the slip. I need to find an o ring for a Ronson Crown lighter. Everything seems functional but the fluid leaks out of the bottom around the screw. There isn't an o ring and I know there should be. Where would I find something like that? Hi Im new to the lighter collection and have come across the rolstar lighter, which I find quite attractive. I have tried to find some information about them but have come up with nothing other than a slight connection to Ronson. Are they related in manufacture? Can someone please help. I have a small, hand held lighter where the wick is inside the 'striker' that unscrews from top of lighter and you strike it down the metal rod on the side- as though you would light a match. Does anyone know anything about this kind of lighter? Did you have any luck? I'm trying to find these too.